Fall is the perfect time to enjoy KVIS (Katonah Village Improvement Society) Saturday Evening Stroll! This community Stroll of the Katonah Galleries takes place the 3rd Saturday of the month from 5 to 8 pm in downtown Katonah. 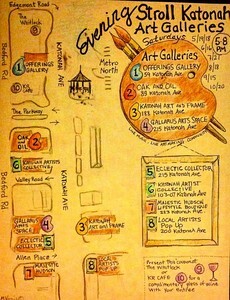 The Saturday Evening Stroll features art, music and fine fare. "Start at the museum, stroll the gallery map, take in some jazz and an art exhibit at the library, see the lovely Katonah-in-Bloom displays, and dine at one of the many fine restaurants," KVIS says. Learn more on the KVIS website here.